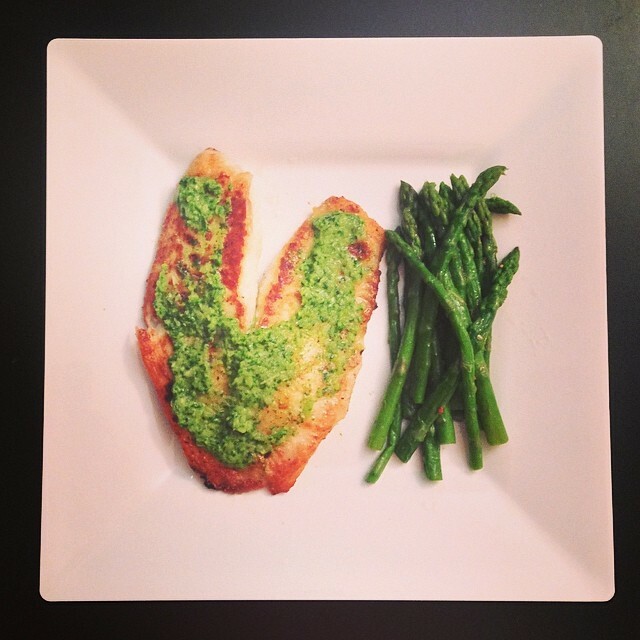 Gone Fishin: Chimichurri Tilapia and Asparagus – Pao Says, "Open Wide!" What to do with a surplus of cilantro? Chimuchurri, of course! This sauce is awesome for adding flavor to anything from seafood to chicken to steak… My personal favorite is skirt steak with chimichurri. … just throw everything in the food processor and press the ON button. done. super easy and awesome. The fish pictured is tilapia that I seasoned with garlic-salt and pepper, dusted in flour, and pan-fried in a bit of olive oil. The asparagus is oven-roasted… I tossed it around in a bit of olive oil, some salt, pepper, and garlic powder. Once coated, I laid it out on a baking sheet, sprinkled it with parmesan, and put it in a 400 deg oven for about 20 minutes.